Each of the female protagonists here struggles with their feelings, not only due to the intense rush of emotion being experienced, often for the first time, but because the feelings they have are for other girls. The social environment and system, from families to peers, make it clear to Johnson’s protagonist that relationships with girls must not go beyond a certain degree of friendship, or concerns and eyebrows will be raised. Feelings of shame and secrecy mingle with the stress of growing up, working out who you are, what your place is, and the questions and confusion that come with all of it. It’s not only the fear of rejection that makes the girls here reluctant to articulate themselves, and compelled to quash their natural, personal growth. “I love her as only a teen can. So hard that my body hurts and nothing else is real.” Those are the thoughts of Foster-Dimino’s protagonist, and it’s a thought acute in its accuracy. As much as teenagers and that period of life is derided as overwrought and sneeringly dramatic, the purity of emotion and the whole fullness of experiences are never quite the same again. It’s an age of essence and possibility, of giving. Later, practicality and reason set in and become stabilizers; learning holds back. That progression is apparent here, and given an extra dimension because the girls are made to feel that wants and desires are wrong, not normal, not allowed. It’s not the fact that they might be gay, but any exploration veering from heteronormative is frowned upon. The way the stories are presented facilitates a reading where the protagonist becomes gradually squashed down by social conditioning and acceptability politics. Johnson’s young woman questions the attitudes of those around her, Zacchilli’s is blustery yet silent, while the lead in Foster-Dimino’s is grateful for the brief, clandestine make-out meetings with her partner (who has a boyfriend). What’s most interesting to see is how each cartoonist’s style lends similar themed stories very different tones and emotional beats. Johnson’s lines are soft: smudges and shadows obscuring and lending weight. Zacchilli brings her signature frenetic energy, so full of personality that it dominates the page, leaving no room for inference; her characters are so bold and busy in showing you they don’t care that it’s easy to be swept up and miss any vulnerability beyond the bravado. Foster-Dimino’s art is more controlled and precise, an attempt to contain and make sense of things. There’s a great panel of an enthusiastically nodding girl that’s all the more effective for the parallel in breaking free of those rigors. The styles complement each other well, working to bring individual personality to the three stories. Comic books are often dismissed as “kid stuff” by people who aren’t fans, derisive and dismissive of an increasingly broad and deep storytelling pool. But “serious” comics fans are just as quick to scoff at all-ages books, relegated to a separate section in stores, away from the violence and the beefcake and the “real” comics. Books like Lumberjanes and Jem are proving that there’s no need to rely on the dark and gritty to tell good stories, broadening audiences and attracting new readers. 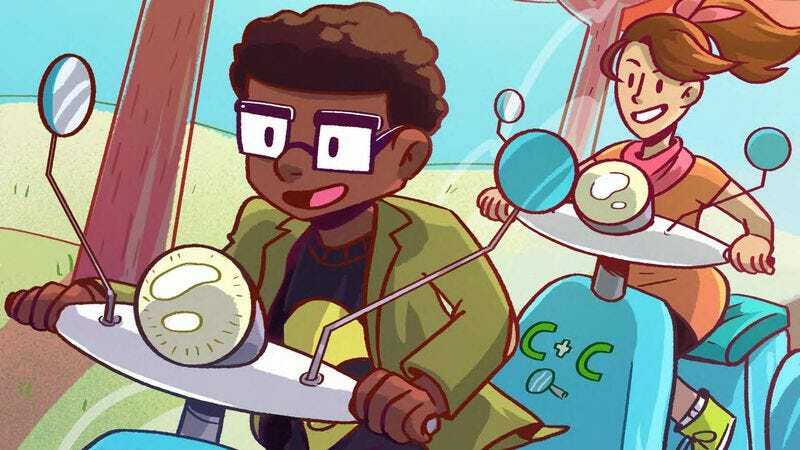 Cash & Carrie #1 (Crowntaker Studios) epitomizes not only what a great all-ages book is capable of, but also how much the industry has changed with the advent of crowdfunding. Starring two middle school detectives as they try to solve the case of a goat-napped mascot, the book features the kind of colorful, fun art that you’d expect in Adventure Time or Bravest Warriors issues. The dialog is silly and sweet without being cloying, and even with just this short first issue, the relationships between the two main characters and their supporting cast are firmly established. Nothing feels rushed or forced, unlike some more famous recent books starring teenagers and children; the creative team has a much better handle than most on not only the characters, but also the intended audience. This isn’t to say that it’s entirely realistic, of course. After all, it’s a comic book about two preteens investigating a stolen goat. But there are panels and even entire pages that evoke the same kind of familiarity that Veronica Mars did. Dallas Cash and Inez Carrie might not talk exactly like real life 12-year-olds—they’re a little too quippy and smart for their own good—but they’re what you’d imagine not-so-noir detectives would sound like if they were 12. The kids are funny and upbeat, and none of the humor is at the expense of other children or the not-so-observant adults in their lives. The story is playful and easy, without losing the bite of mystery. Since the dawn of this century, the comics industry has been awash in a new Golden Age—not of content, necessarily, but in terms of the preservation and republishing of the medium’s great achievements. Given the deluge of reprint projects across all quadrants of the comics industry—from Fantagraphic’s Complete Peanuts through multiple sumptuous editions of Winsor McCay’s Little Nemo, to say nothing of the attention given to manga and even bandes dessinées—it may be tempting to conclude that there are few great works left to be uncovered. But there are still worlds to conquer, and one of the most ambitious preservation projects in the history of modern comics is now just barely underway. The new eleventh printing of Dave Sim’s High Society (Aardvark-Vanaheim) marks the latest fruit of this Herculean (or perhaps Sisyphean?) endeavor, following 2013’s reissue of the first volume, the self-titled Cerebus. While the entirety of Sim’s Cerebus has remained in print for decades, this new edition represents a significant upgrade from the old. Longtime comics fans will remember the once-ubiquitous Cerebus phonebooks, formerly a mainstay of every well-stocked comic shop, now more likely to be found clustered in quiet corners of second-hand bookstores. While there has been much ink spilled on the myriad reasons why Sim and his creation have fallen so severely out of favor, this new printing of High Society highlights the degree to which the continued existence of Cerebus has become less a matter of the contentious present than of historical insight. In other words, while Sim’s later career may be inarguably (some might argue irredeemably) marred, the early Cerebus is worthy of respect and still deserving of its privileged place in comics history. If you have any of the original phonebooks on your shelf, you may be wondering why the series might be in such dire need of preservation. The answer is simple: the original photo negatives were already degraded and have since been destroyed in a fire; the original pages are degrading, as well as scattered to the four winds in the hands of private collectors; and the series itself has drifted so far out of public consciousness that there are precious few resources left to be allocated for restoration. Accordingly, this new volume is the result of a crowdfunding effort, in addition to hundreds (thousands?) of dedicated man-hours of volunteer work. The results speak for themselves: This edition of High Society sets a new standard for the restoration of modern-era black-and-white comics. Both the original books and the phonebook reprints are by now yellowing and smudged, with muddy crosshatching and blurry zip-a-tone. The new volume is crisp and white, on superior paper with immaculate digital printing. A side-by-side comparison reveals just how much intense labor went into every single line of this 500-page behemoth. In the ruins of a devastated urban metropolis, a young woman named Aria sings opera and plays with her cat, Jelly Beans, trying her best to live a happy life as she searches for a mythical energy source. She’s on the sixth year of what was supposed to be a three-month mission, but Aria won’t let the potential futility of her mission get her spirit down. “You know, for an apocalypse… it ain’t all that bad,” she tells Jelly Beans as they watch the sun set over a city overtaken by nature, and that plucky perspective brings a lot of charm to Andrew MacLean’s debut graphic novel Apocalyptigirl: An Aria For The End Times (Dark Horse). Just because it’s the end of the world doesn’t mean Aria can’t have a little fun, which gives this story a much brighter tone than typical post-apocalyptic fare, especially at the start. When readers are introduced to this environment, it’s not through a depressing recounting of the events that led to its destruction, but through lush natural imagery, a warm, inviting color palette, and a cheerful lead hero. It’s a very inviting start, drawing the audience deep into the setting while establishing both the loneliness and the wonder of Aria’s lifestyle. Solitude is a big part of MacLean’s narrative; Aria’s relationship with Jelly Beans is essential because he’s the only living thing that she’s had any sort of meaningful interaction with over six years, and when Jelly Beans is off on his own, Aria chats with her own narration to gain some company. The book starts with a more playful, lighter atmosphere, but when Aria’s story takes a more serious turn, MacLean makes sure it’s told with excitement, energy, and just the right amount of humor. He doesn’t get weighed down by exposition, and when the script does delve into the history of this world, it does so with a new creation myth that relies on symbols that hint at different causes for the fall of civilization, leaving the true story open to the reader’s interpretation. How the world got to this point isn’t as important as what Aria has to do to survive and accomplish her mission, and after the calm opening, the pacing quickly accelerates as action breaks out and Aria is forced to fight and run.